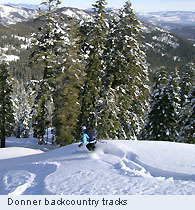 We love to ski the backcountry! This is the ASI workhorse course to get you away from the lifts and into the backcountry. This one-day seminar is perfect for alpine skiers who want to learn to use convertible touring bindings or telemark skiers ready to ski the backcountry. You'll learn about the most appropriate gear, good tricks and techniques with your climbing skins for the uphills and strategies to find the best snow on the downhills. We'll enjoy some great skiing on the descents. Rentals offered through The Back Country at ASI discounted rate. Very good physical condition. Strong intermediate/advanced alpine, snowboarding or telemark skiing skills at ski resorts. Previous skiing & riding in ungroomed snow conditions recommended. Please review the Ski Technical Difficulty rating link above. "I picked up so much more information from this class than I ever anticipated. Bill covered the course outline in detail and filled in the blanks with anecdotal experience and practical tips."